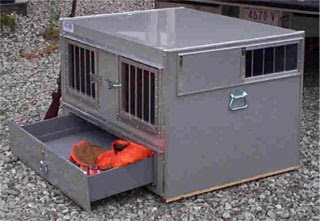 > I recently purchased one of these dog boxes from Jackson Creek Manufacturers in North Carolina. Their service was phenomenal! I used it for the later part of the season last (2007-8) Fall. My dogs stayed warm in freezing rain in Kansas, and they were cool in February when we were hunting Mearn’s quail, and it was 80 degrees out side. 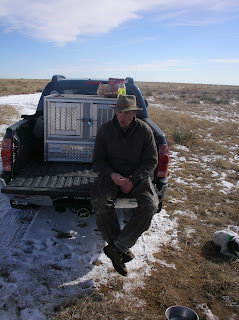 I’m very pleased with the dog box and would strongly recommend one for your bird dogs! >Could I fit a 90lb Drahthaar in one of the sides? What about summer training/driving in 95 degree heat? >Chet…good questions! I would have one custom made to fit your Drahthaar! I can fit two 35-40 lbs dogs per side…but it be difficult to fit your dog without it being taller! The boxes can have the front and side open for excellent circulation. I bring my dogs to work almost everyday…and heat doesn’t seem to be an issue!